Though ferrous alloys with more than 2.14 wt.% C are designated as cast irons, commercially cast irons contain about 3.0-4.5% C along with some alloying additions. Alloys with this carbon content melt at lower temperatures than steels i.e. they are responsive to casting. Hence casting is the most used fabrication technique for these alloys. Hard and brittle constituent presented in these alloys, cementite is a metastable phase, and can readily decompose to form α-ferrite and graphite. In this way disadvantages of brittle phase can easily be overcome. Tendency of cast irons to form graphite is usually controlled by their composition and cooling rate. Based on the form of carbon present, cast irons are categorized as gray, white, nodular and malleable cast irons. Fig. 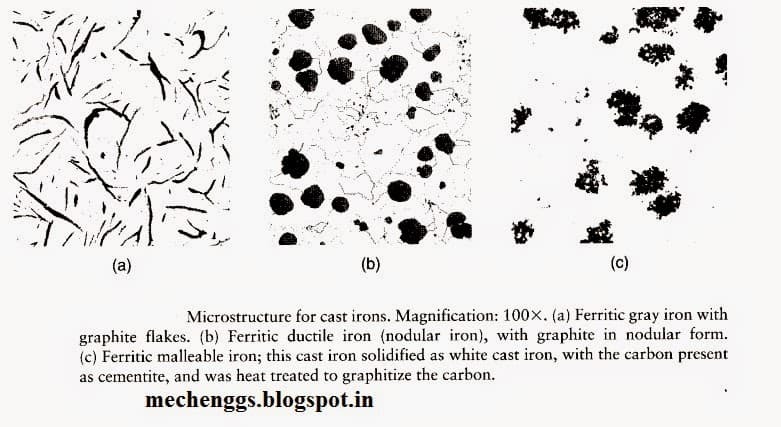 Microstructure For Cast Iron. typical applications include: base structures, bed for heavy machines, etc. they also show high resistance to wear. When Si content is low (less than 1%) in combination with faster cooling rates, there is no time left for cementite to get decomposed, thus most of the brittle cementite retains. Because of presence of cementite, fractured surface appear white, hence the name. They are very brittle and extremely difficult to machine. Hence their use is limited to wear resistant applications such as rollers in rolling mills. Usually white cast iron is heat treated to produce malleable iron. Alloying additions are of prime importance in producing these materials. Small additions of Mg / Ce to the gray cast iron melt before casting can result in graphite to form nodules or sphere-like particles. Matrix surrounding these particles can be either ferrite or pearlite depending on the heat treatment. These are stronger and ductile than gray cast irons. Typical applications include: pump bodies, crank shafts, automotive components, etc. These formed after heat treating white cast iron. Heat treatments involve heating the material up to 800-900 degreeC, and keep it for long hours, before cooling it to room temperature. High temperature incubation causes cementite to decompose and form ferrite and graphite. Thus these materials are stronger with appreciable amount of ductility. Typical applications include: railroad, connecting rods, marine and other heavy duty services.